Let me take you back to the first decade of the 21st century which is often regarded as the decade of innovation, the one that witnessed many revolutionary technological inventions. During that time, the consumer home was changing in many exciting ways with an influx of new and improved entertainment devices, home theater systems, home automation products and more. Since launch, Nevo line of products have been changing what an ultimate home control solution should look like, and has been constantly finding new ways to put consumers in charge of their devices and services at home, all through elegantly designed products and experiences. This post is dedicated to each and every member of Nevo Labs who have contributed in building these great products that are still an inspiration for one and all. Nevo - New Evolution in Home Control, symbolizes our vision and journey of building an extensible smart home platform, beginning at a time when even the idea of a connected home was in its infancy. In this post, we will discuss a few Nevo products. More detailed Nevo story can be found here. Predicting the expansion of digital media and personal content in the home (although a bit too early! ), Nevo allowed the users to browse digital media content across devices. In order to complete the experience, Nevo also included a complete bundle of media server & player that could make users' content on personal computers accessible across home networks. As the next natural step, Nevo was integrated on Viewsonic Smart Displays (the predecessor to what we call Tablets now, what Steve Jobs is said to have initially questioned as a viable product and yet he created the best version of!). These devices offered a much larger surface for home control, and we could always see how they could benefit the experience as a second screen in the Home. However, these products were limited to a small segment of the market, and never made it into the mainstream, partly due to price points as well as other technological gaps that still existed in the home. Team Nevo had already started working on the next set of products. The final sketch of Nevo SL proudly signed off by the design team as they continued to work on the next designs can be found below. "Nevo SL, with its hybrid or multiprotocol (IR and Wi-Fi) support and UEI's connectivity software, is cool, useful, and certainly a contender to win the hearts and minds of consumers"
With the NevoStudio Pro software, installers could use the Nevo widgets to create smart graphical elements and target-specific rules, add actions to assign them to a widget for a dynamic graphical user interface. Imagine a configurable thermostat widget (that actually looks like a thermostat, maybe a circular one!) that you can really interact with, which also provides a real-time feedback so that you can turn the knob and see it adjust. People simply loved the power that these widgets gave them through simple visual programming. We basically empowered every single installer to really take over a strong home gateway such as Nevo. The NevoXpress wireless download feature also enabled an over the air update of devices, remotely! It enabled simple programming updates as long as the user had Wi-Fi network without any additional cables or special instructions, or better yet, it allowed a professional installer to remotely push updates to the Nevo controller devices so everything keeps working just as expected. This technology can be considered as the trendsetter for today's whole home solutions that are trying to build similar solutions to simplify the experience of the end users. The key here is to deliver this level of experience, originally offered to professional markets to a much larger and mainstream audience. Nevo Home live dashboard enables the users to navigate through the usage history across devices, capture and share favorite moments and receive proactive notifications. With Nevo Home, users can also achieve one-touch control of their devices and the associated content. The App is free and you can download the latest version of Nevo Home from Google Play Store . Since its launch, Nevo has helped evolve the smart home experience. We are living in interesting times where the connected home is evolving faster than ever and many great products and services can really benefit the consumers, as long as they can respect the consumers' desire for interoperability with other services in the home. This is possible with an even playing field for all innovators, avoiding a future of duopoly that may risk innovation in the long run. This year at Consumer Electronics Show (CES) Las Vegas, we presented the preview of Nevo AI. Nevo as a personal assistant will leverage all functions and capabilities of QuickSet and add a layer of intelligence to make the device setup, control and interaction even simpler than before. Stay tuned for more updates on this one! P.S This is a short version of the extraordinary journey of Nevo products. Click here to read more. In 2016, Samsung revolutionized the TV industry when they launched their 9500 series of smart TVs, powered by QuickSet. We are elated that consumers are thoroughly enjoying these TVs that have decluttered the remote basket in their homes and given them what they truly care about - easy access to content and services. With this TV, Samsung provided a simple and unified user experience across devices and content by utilizing QuickSet platform and its extensive knowledge graph of devices. Automatic discovery of devices and configuration of TV remote unit for it to control virtually any device that gets plugged into the TV, a unified content interface for users to be a touch away from their devices or favorite content and many other features make it a revolutionary television where things just work when the users need them to. A recent survey by Parks Associates claimed that 75% of the consumers purchasing a new device want it to work with the existing devices within their homes. This means that consumers value interoperability, but what does this actually mean? What is it that consumers really want?! Let's take a look at some examples from today's homes. I am a consumer and want to buy a new garage door opener. Before making a purchase, I want to make sure that it works with the existing hub in my home and I can use the same interface to see my garage door status or control it! Last week, my roommates and I decided to purchase some window shade controllers for our home and ended up spending a lot of time looking for the specific brands that work with our existing thermostat. This is what interoperability means to a consumer, that any new device that enters the home works smoothly with all other existing devices. Interoperability can be defined as the ability of any device within an ecosystem to work with any other device that is present in the same environment without any additional efforts from the consumers. An environment where all devices work with each other in harmony. Manufacturers have tried to address this pain point either through a centralized hub such as the TV in the living room, acting as an orchestrator in the environment or by building interoperable devices that work with major hubs or assistants already existing within the home. A recent survey by Open Connectivity Foundation revealed that over 37% of the audience that was trying to adopt a new device, claimed that devices not working with each other was their single largest barrier in this process. They face out of the box problems with their device setup followed by unexpected difficulties in their daily usage, control, and interaction. The increasing demand for interoperability has made manufacturers realize that for them to build successful products, it is essential to make them interoperable. Whether they are selling security cameras, garage door openers, switches, plugs, or any other device that consumers care about and have in their home, these manufacturers are forced with new challenges to ensure interoperability. These challenges involve heavy investment in designing, building and maintaining infrastructure to make their devices interoperable. Truly interoperable systems should consistently discover and interact with devices regardless of their underlying properties. When it comes to interoperability, QuickSet is already making major consumer electronics brands an orchestrator in the house, such that they can discover and control all compatible devices. On the other side of interoperability, when offered as a service, QuickSet enables manufacturers to leverage the interoperability that comes native to the platform. Over 500 Million devices globally are using QuickSet to discover and interact with other devices in the home. QuickSet offering Interoperability as a Service effectively makes any device interoperable with this growing install base of devices. 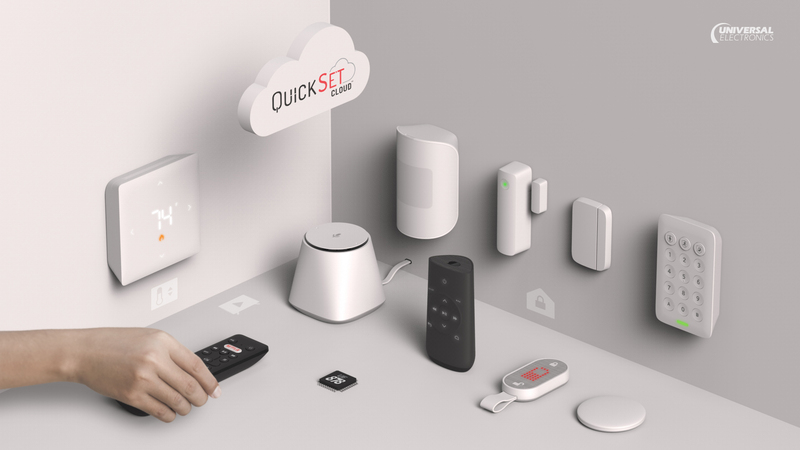 Interoperability as a Service offered by QuickSet allows manufacturers to leverage the power and reach of this platform to make successful products that interoperate with already installed devices in the home without having to go through the challenges and investment mentioned above. QuickSet offering Interoperability as a Service enables device makers and manufacturers to easily build interoperable devices. QuickSet’s Interoperability as a Service will further address these challenges for the ecosystems that are not powered by QuickSet's technology. As an example, a sprinkler system or a garage door opener will soon be able to work with any voice assistant present in the home, using this service. This means that device manufacturers do not have to build any additional "skills" or "actions". Stay tuned as QuickSet team is expanding the offerings in this category.